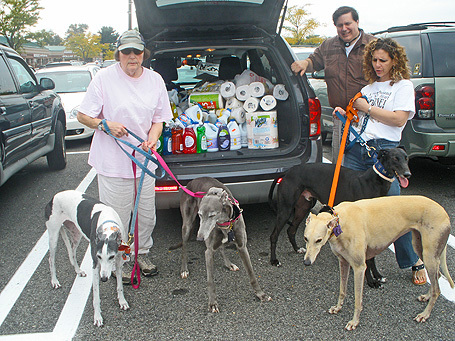 Long-time volunteers,Eileen and Michael Saks, organized yet another successful Meet & Greet at Redner's Market on behalf of the National Greyhound Adoption Program. Eileen, Mike, Caroline Vogt and Lisa Fritz handed out flyers to patrons as they entered the store which listed the things that we use each and every day. This is the second such event for NGAP and just like last time, it paid off in towels, bleach, detergent, soap, etc, etc, etc. - as you can see from the photo! Believe me when I say that these items are all things that we use all of the time. If we didn't get them through events such as this, we would have had to spend money to get them. I wish the Redner's idea would catch on and other stores would follow suit. I also wish that other adopters would be interested in organizing events like this. NGAP can provide the flyers and even a big truck, if need be! In most cases, you simply need only to contact the store to get permission and find some willing friends with greyhounds! The construction of our clinic is complete, it's true! But the money we used to construct it has run out so we need to be aggressive at fundraising to continue helping the greyhounds. All of the items collected are, in our eyes, equivalent to funds.